There is a biblical saying about no man being a prophet in his own land (Matthew 13:57) that I like. It would seem that people have been thinking about resistance to change for thousands of years. Why do we resist change? This has been one of my central questions, almost obsessional, for a some time. Popular wisdom would explain fear, threatened egos and a desire to protect the status quo as the reasons for resisting change. Rob Evans, clinical psychologist and consultant to stakeholders in education told the audience at Building Learning Communities conference in Boston two years ago that teachers experience change as a sort of grief process. Before change can happen, they have to let go of ‘old’ ways and cope with loss. My own answers to the question of why we resist change currently lay in brain research but the source or veracity of the answer is not as important as hearing the loud voice of the evolutionary imperative admonishing educators, schools, administrators, governments and those who have the power shape the learning experience of students to “adapt or die”. Read any of the popular books on innovation in business, for example Phil McKinney’s Beyond the Obvious. As you read, substitute ‘client’ for student and ‘product’ for pedagogy. If you can endure some internal discomfort created by superimposing a business model onto education, the idea that pedagogy and instructional design needs to fit the needs of our students (clients) becomes a useful metaphor. Continue reading further to understand that successful businesses pay very close attention to the needs of their customers. When the customer loses faith in the product, the business is in danger. “Yes, but school is not a business” you say? “Wait and watch what happens when students understand that they can access learning anywhere, anytime and on demand”, I say. The digital age has released information and knowledge from the prison of the page (David Weinberger “Too Big to Know”) and that is changing everything. I remember the day when I realized that everything had changed. 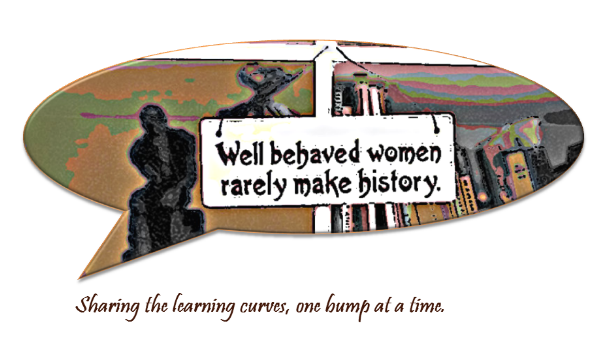 I was introducing some ideas about sociology to a grade eleven class and referred to a famous study of behaviour in public restrooms when I faltered and was unsure of the author’s name. Mason, my ever-eager student said, “Wait Miss. Let me check that for you!” At that very instant, as I looked out over the 21 students behind 21 laptops screens, I realized that I had become accountable to the truth and learning in a radical new way. 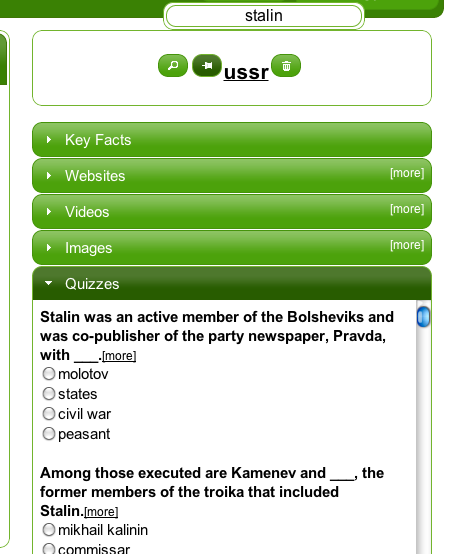 When fact checking and information recall is one click away, teachers need to rethink how and what they teach. In the ‘Land of Google’ where students drink from the firehose of information, teachers must ask the ‘killer questions’: why is this important? how is this relevant? and what will they remember about this in five years hence? Students in higher education have new choices today in how they learn. MOOCs and open courseware, online universities and blended classrooms were not on the learning landscape horizon only a few short years ago. The student (the consumer, the client) can access learning anywhere and personalize it. This fundamental shift in the availability of information made possible by the digital age is changing education. Schools, teachers and all stakeholders of the educational process need to see that the ground is shifting. Just as the music industry and the traditional paper press has had to reinvent themselves, so do schools and teachers. Intel’s co-founder, Gordon Moore, observed that our energy efficiency for computer processing speed doubles every eighteen to twenty four months. His 1965 observation has remained true. In 1971, the Intel processor held 2,300 transistors and today holds approximately 560 million. This exponential growth of computational capacity has made our time in history unlike any other. Never before has technological change been so rapid. Today we speak of interactive technologies (such as Luidia’s e-Beam that turns a white board, a wall or even a floor into an interactive space) but it is very probable that within two years we will be speaking about immersive technologies, such as the Muse from Interaxon. This simple headband with sensors reads your brainwaves (EEG technology) and allows the user to actually see into their minds. It can interact with apps on an iPhone or iPad and even move physical objects using only thoughts. Imagine this in the hands of a child with ADHD who would benefit from learning cognitive control. This self-observation of mind states has incredible potential for transformation much like any meditative mindful technique (such as Kiran Bedi’s controversial and successful rehabilitation of Indian prisoners using Vipassana meditation). So why would schools not want to harness new technologies in the service of education? Change is not enough to meet the demands of this rapidly morphing learning environment where classrooms do not have to be physical spaces and teachers are not always adults with degrees. Innovation needs creativity, courage and vision. Innovation is disruptive and does not encourage uniformity or compliance. The future has arrived and adaptation might help you survive but innovation will ensure that you thrive. But this post is not about these great online tools; instead about an obscure reference someone left in the chat called Crocodoc. This is an application that works in the browser that allows commenting, annotation and markups of pdfs, word docs, images and other office applications like power point. Once the document has been annotated, you can share it quickly by emailing the link or embedding it in on a web page as you see below. I can imagine how useful this will be with my students and colleagues. 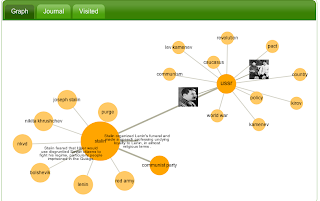 Many of us are using Diigo with students and teaching them how to annotate web pages and share resources with the class. Google docs is also an important tool for collaboration and a part of my online classroom. But Crocodoc is going to be another 'instrument in my kitchen'. I love that I can easily markup pictures and then invite someone else to join me. When the work is done, you can download both the original and annotated file and compare the two. Even though this was not mentioned in today's session, Crocodoc ends up being the tool that caught my attention. Try it out. Teachers understand the power of the story. When we share personal anecdotes, we capture the students’ full attention. We explain concepts with metaphors and images, sort of snapshots or thumbnails of a possible story. Effective presentations use visuals to create the emotional resonance necessary for the listener who is considering the veracity of your message. Presentation gurus like Nancy Duarte and Gar Reyonolds teach us that the story arc in the presentation is just as important as the slides and visuals that we use. Like many others from a liberal arts background, I understand the power of stories from a Jungian perspective: the story’s universal appeal is explained by the archetypal self who seeks to individuate. Essentially, you must be the hero of your own story as you grow to adulthood and psychic maturity. Jungian depth psychology has been how I understand the power of the story. 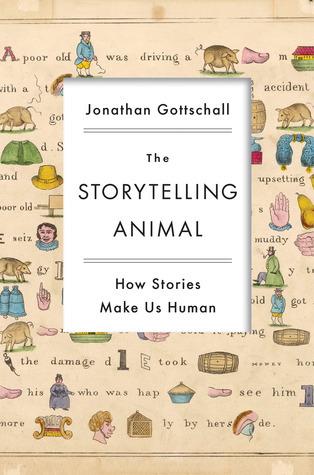 But today I considered other explanations after listening to Dr. Ginger Campbell (Books and Ideas Podcast) interview Jonathan Gottschull’s new book, How Storytelling Makes Us Human. Gottschull is an literary scholar at Washington and Jefferson College who was struck by the dangerous landscape of the make-believe stories he observed in his two young daughters. He wondered about why children create gore, death and danger in their play and storytelling. Gottschull began to think about the evolutionary forces that would shape the need to tell such stories and explain why we derive such pleasure from danger. In Dr. Campbell’s interview, he notes that fiction and fantasy of children (think of Neverland and Grimm’s fairytales) is a scary and dangerous place fraught with violence, filled with hobgoblins and moral abomination. From an evolutionary perspective, the purpose of this conflict was to provide the brain with vicarious experiences so we could learn possible responses to potential danger. Fiction's purpose is biological. It prepares us for what could be; a kind of ‘training manual for the big dilemmas of life’. Gottschull is interested in the neural underpinnings of the imaginary experience. Recent experiments suggests that the brain responds as a participant when reading about the emotions of the protagonist. It is in the ‘this is real and happening to me’ mode. Dr. Campbell talked about her own emotional investment in the character she was role playing in the video game Mass Effect. Video games are a modern version of the ancient story. Dr. Campbell’s interview with Gottschull was well worth one hour of listening time and important enough for me to commit to sharing it on this blog. We intuitively understand why stories are important and now we can look forward to neurological explanations for the power of the story. I encourage you to listen to this interview and the next time you give a presentation or read a great story with your students, remember that fully engaged brain wants to experience the conflict, problems and everything else that comes with the story as a real event. I taught in the same school with a teacher for one entire year before we realized that she had been my student in my first year of teaching. Neither one of us remembered the other's name or face but she remembered my stories. One day when she was telling me about a teacher she had in high school and sharing the stories this teacher had told, I realized that those were my stories and that teacher was me! Think of it. She did not remember the content of the class, my name or my face but she remembered my stories. I spend a lot of time thinking about change and why people (especially in education) resist change. I wonder about why we experience change as difficult. I read books about it and gravitate to discussions about how to facilitate change, how to anticipate it and how to manage the new dynamics that it creates. This is a year of change for me and for my school. I have moved into a new administrative position and our beloved Director of Studies is preparing for his retirement in January of 2013. My questions about change feel urgent to me right now. There is no resistance to the change in this situation. I am thrilled about my new position and our Director is happy to retire. He looks forward to spending more time with his granddaughter, has plans to fix up his house and wants to become like one of those old men in the TD bank commercial who refuse to accept advice. But despite the joy connected to this change, I am aware of my own fears, probably the culprit for recent sleepless nights. Last night, ruminating about change, this occurred to me. Allow me to draw you a mental picture. You are standing with your back to the wall trying to look cool and carefree at the dance. An attractive person crosses the floor and with irresistible style asks you to dance. At that moment, for one second, you freeze. You are a great dancer and everyone knows it. He (or she) is exactly who you were hoping would ask you to dance. So why freeze? Hold this picture in your mind and consider this idea: change is an invitation to show yourself. Change creates an empty space. What once filled that space is gone and now, that space demands to be filled. What will take its place? Obviously dancing is my metaphor for the art and science of teaching. We are passionate dancers (teachers) and we know our steps well. When new dances come along, we learn the steps because dancing is exhilarating, life affirming and we do it so well. So what to say to the dancer who hesitates, despite her (his) skill? Here is what I want to say to all the dancers: your talent and your passion for the craft is all you need to fill the space and accept the invitation. You will not be perfect the first few times out on the floor but the thrill of the dance and the grace of the movements will renew your desire to become the best dancer you can be. The sweet spot in the never ending change that is the educator’s life in the 21st century learning spaces is the knowledge that you can do this and you are talented. Show yourself. Step into the space that the invitation to change makes and have confidence that in time, you will become the graceful dancer that you know you are. Our soon-to-retire Director of studies has had 32 years to perfect the art of change. His ‘sweet spot’ is his dedication to the pursuit of excellence. He knows that as long as he holds this pursuit as his goal, he will eventually be successful. Mistakes are inevitable but his commitment to the pursuit of excellence has been his ‘sweet spot’ and the source of his graceful confidence throughout the years. Find your sweet spot and accept the invitation to the dance that never ends. Show yourself. You never looked so good. Embed a Google Books search query on your wiki to help students improve their researching skills. Posted from Diigo. The rest of QAIS Teachers group favorite links are here. Use Google books with your students. Have them prepare and share their virtual bookshelves with their favorite reads. Google books should also be a part of comprehensive searching. Also, you can embed the book itself on your wiki or class website. The Canadian Teachers Federation and the Canadian Education Association (CEA) recently published the their joint research report Teaching the Way We Aspire to Teach . In focus groups across the country and from more than 4,700 online respondents, the CEA painted a picture that should give hope to everyone who cares about education in Canada. We, Canadian teachers, are not an embittered, alienated bunch but deeply compassionate and highly committed professionals who have their students’ growth as their first priority. I was not surprised to read these findings. Nor was I dismayed by some of the real obstacles to aspirational teaching published in the report: insufficient resources, unsupportive school leadership, lack of collaboration with colleagues and the ever present challenge of finding time. Why not dismayed? I am not illogically optimistic but I am solidly hopeful for the future of teaching and learning in Canada. Why? 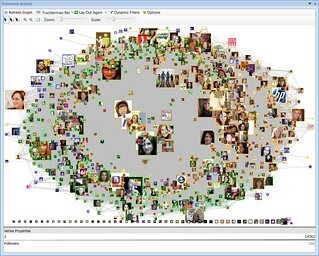 One word - networks. Three books have changed the way I look at the art and science of teaching and learning (as well as numerous bloggers and Twitter friends). Connected by Nicholas Christakis and James Fowler, Too Big to Know by David Weinberger and Linked by Albert-Laszlo Barabasi taught me about the nature and power of networks. In Connected, I learned about how ideas move across networks and how only three degrees separate me from anyone else. Attitudes, beliefs and even lifestyles of someone I do not know will have an impact on my life. In Too Big to Know, I learned how the web is changing the shape of knowledge itself. 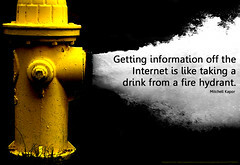 Information has been liberated from the prison of the page and answers are only a link away. In Linked, I learned about the properties of networks and came to see them as an evolutionary force shaping both biological and social systems. So what does any of this have to do with how Canadian teachers feel about their craft? The answer comes in the shape of another question. What would happen if teachers looked at the education system, failings and all, as a network and as themselves as nodes in that network? How would that change their daily routines, attitudes and beliefs about what is possible for their students in the classroom? I am guessing that the change would be nothing short of the proverbial paradigmatic shift. Of course this new self-image (“I am a network node”) would not be an answer to all of the obstacles that teachers face but it would be an important starting point from which to begin the change the ‘system’ needs. Consider the following picture: Ms. Linkedin arrives at school by 7:30 for her 8:00 class. She is prepared to answer her students questions on last night’s lesson posted on the class wiki because their homework was to write their questions on a shared Google doc. This took no more than 10 minutes of her time and allowed her to adjust the morning’s lesson to accommodate for their questions. (The lesson was a video she flipped using the TED Ed site.) A departmental meeting is planned for her first spare of the day and as head, she has reduced the meeting time by half by collaborating asynchronistically on a Google doc. During lunch, Ms. Linkedin takes ten minutes to read a few tweets from her #edchat Twitter stream and to contribute a few of her own. The afternoon is smooth partly because of a great idea she gleaned from her PLN about assigning different roles in group work and now the class is humming with excitement. At the day’s end, Ms. Linkedin leaves deeply satisfied, partly because of her students’ enthusiasm and partly because of a parent’s compliment about the good work she is doing, evident by the open class wiki. I could go on but I think the point has been made. In this network in which we live and work, we are not invisible and we are not alone. Change and growth is inevitable and networks is the mechanism by which this happens. We are not alone nor are not powerless against an inflexible and outdated system. If we ‘grow’ our networks and connect to a like-minded learners, we will achieve more aspirational teaching than ever before. Become the node in the network and watch the change happen. Last week at Alan November's very fabulous BLC12 conference in Boston, I listened to Mike Pennington and Garth Holman in a session about designing 21st century assignments. They absolutely rocked! When a 'false' fire alarm went off instructing patrons to leave the hotel, nobody moved and audible groans were heard not because of the inconvenience of the alarm but because session participants were so completely engaged, no one wanted to leave their seats. We learned about how their students have collaborated on a wiki to write their own textbook. (I had heard Alan November interview them two years earlier about this and since then, they have grown and become even more dynamic.) The curious thing is that these incredible teachers are not in the same school. They collaborate from a distance with an ever-present skype camera always turned on so that students in either class can see what is happening in the other class. Thanks to their generosity and ethic of sharing, you can look at their slide deck and resources here. Among the great resources they shared was this gem: Instagrok - a search engine that records your search, provides interactive multi-media content and a visual interface so students can see what ideas are connected to their search query, much like Google's extinct Wonder Wheel. Students can adjust the level of difficult of the search by adjusting this small scale. 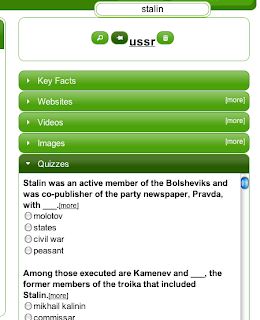 Teachers can choose from a variety of multi-media resources and use the quizzes Instagrok offers to check prior knowledge before beginning research. 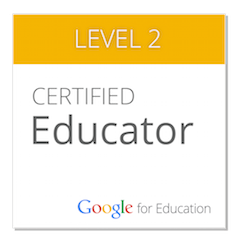 I can hardly wait to try it out with my students! From an initial encounter, I think the journal feature is what I will value most. Instagrok keep a journal of the search and students can share their search results with classmates, archive it for themselves or even present it as evidence of learning for the teacher. This looks like a keeper to me. Even though it seems too early to be thinking about returning to classes, (like hated Christmas retailing in July), there were many interesting conversations about the importance of the first five days at BLC this summer (Building Learning Communities conference with Alan November's team in Boston) in the new academic year. Students return after a long summer break anxious and excited about the beginning of new challenges. Who will be their teachers? Will they like them? Who will be in their classroom groups? What challenges will they face? 1- What kind of learner are you? 2- What do you expect from this course? 3- What do you expect from yourself? 4- What do you expect from me? I love to read what they expect from me; typically they want me to be fair, encourage them and be understanding. What they want from themselves is also revealing; to try my best, not procrastinate and always be learning. But I need add, change, scrap that list of questions and replace it with their questions. What if they asked (and answered) their own questions about their new course? What would happen if I stepped out of the way and let them design the questions? We will need to revisit the answers several times before the end of the course to see if their needs are being met and if we need to ask completely different questions. In this video Greg Whitby and Ewan McIntosh remind teachers and administrators that the time to get serious about change has arrived and it is NOW. We need to think about this as we prepare to meet our new students at the beginning of the year. Ewan McIntosh says it succinctly; don't wait for permission to do it differently. Listen to the video and see how you will answer Ewan's question about being the 'dawdler or the doer'. Teachers have a natural 'reflection' impulse at the end of the school year. We look back over the road traveled in the academic calendar, reflect on our practices and begin to make an inventory of sorts. What were you most proud of this year? (Chances are it was something you helped and inspired your students to create.) What really rocked and what needs improvement for next year? This year I began using the Smartpen from Livescribe. This cool pen records everything it hears and writes. It uses a special paper with teeny dots. There is a camera at the tip of the pen that takes continuous pictures of the dots (only .3mm apart) and a microphone that records what it hears. So the audio is linked to the writing. (Read here to learn more about how it works.) Once the document is uploaded to the desktop application on your computer, it can be shared easily by email, to Google docs, to Facebook or embedded on a web page. Initially, I used the pen to take notes and record lectures at conferences. This enabled me to share the recorded keynote with my colleagues as I archived the documents (pdf files with audio) on our wiki. But it wasn't until later on in the year that I really discovered the power of the pen! I recorded my students' oral presentation (as I took notes) and their debates. This allowed me to listen to their presentation again (and again!) as I finalized and confirmed my initial evaluation. 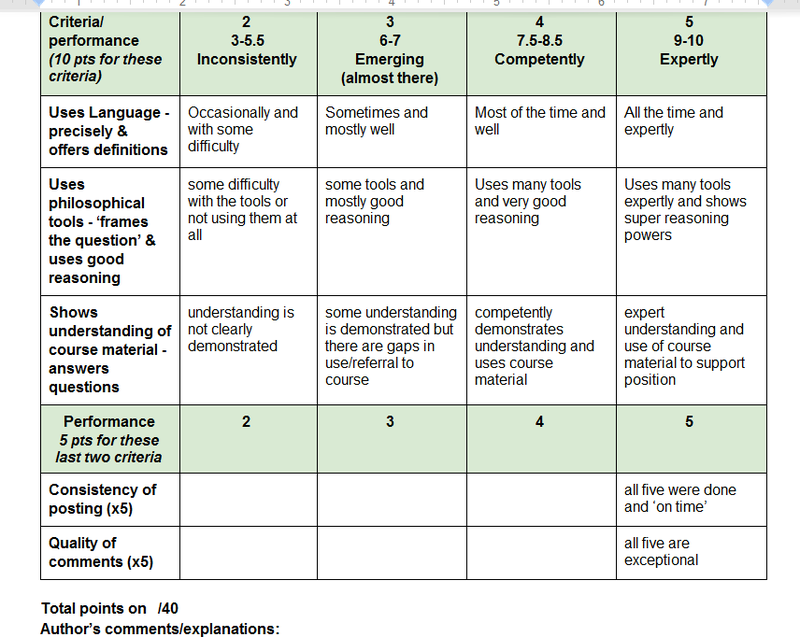 There are so many variables to juggle when assessing oral presentations that the Smartpen gave me the freedom to give full attention to one or two criteria (development of argument for example) and then return to the recording later to pay more attention to a minor criteria. The Smartpen lets you jump to any part of the recording by simply tapping on the text. Imagine using this as you evaluate a debate! Set up your evaluation page in the Smartpen notebook so as to represent the order of the speakers and listen again to that rebuttal! I encourage students about to embark on their Cegep careers and university programs to buy Livescribe's Smartpen. The Echo pen has 8 gigabytes of memory and that should be more than enough. Parents, this is a must by graduation gift for your kids! These elderly people sat quietly in their chairs, not acknowledging their perplexed audience below. Understand this as you will; its meaning is not as striking as the contrast it provides between the divergent needs of these two groups and way in which their voices are heard, or not. It is inevitable. Computers crash, hard drives die and servers can fail spectacularly leaving their dependents (teachers and student in this case) gasping for our virtual breath. Today was one of those days when even plan b gave way to plan c and d! In my Philosophy for Teens class, we turned our temporary 'web-less-ness' into some old school fun. For homework, the students had watched two short videos on the amazing Alice Sommer-Herz, a centagenarian who survived the Nazi camps and lived to share her love of music and inspiring wisdom in her book, "A Garden of Eden in Hell". They had also read Einstein's famous essay, "The World As I See It". 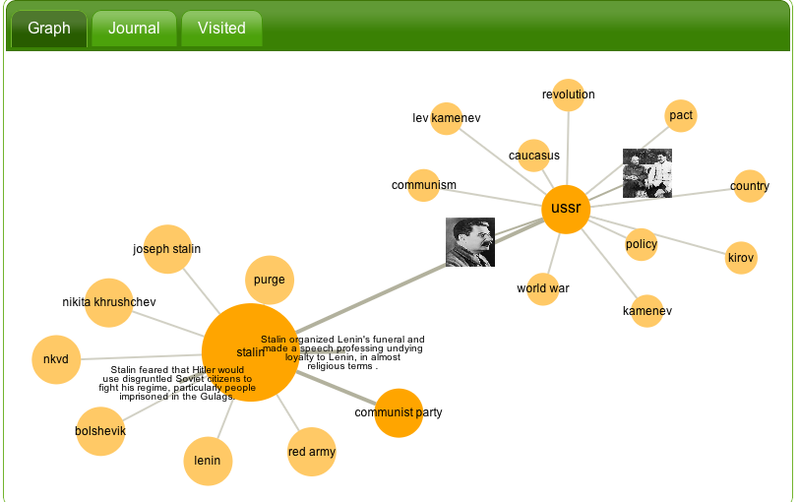 In class, they worked on individual concept maps for each thinker (Sommer-Herz and Einstein). Then together they went up to the board and worked on a collaborative map. Normally, we would have done this activity with mindmeister but today it was paper, pencil and the whiteboard. It was, as they say, 'old school' but they thoroughly enjoyed standing up at the board and deciding together, what idea goes where and who writes what. I was pleased and somewhat surprised at how well the lesson went. To be sure, the visual representation of ideas and their connections is a powerful way to learn, done digitally or on the whiteboard. In my Philosophy for Teens class, the students have been learning about the skills necessary for good conversations; listening, clarifying, paraphrasing and elaborating ideas with examples. They have also been introduced to Socrates' dialectic; teasing out weaknesses in arguments using only questions instead of statements. The Socratic method is the ultimate teaching tool because the 'student' themselves comes to understand that they had the 'knowledge' all along, even if the knowledge was that their initial assumption was flawed and now they must re-examine their argument. Conversation is essential to learning and students love to talk! In Academic Conversations: Classroom Talk that Fosters Critical Thinking by Jeff Zwiers and Marie Crawford, teachers can find many great ideas for integrating these important skills in any subject area. I shared the five core conversation skills with the students in the Philosophy for Teens class and asked them to come to class with their ideas mapped out on a graphic organizer I had prepared. Then, in pairs, they tackled Plato's idea from Protagoras about knowledge being the greatest virtue. The students were introduced to the American philosopher Martha Nussbaum's assertion that compassion is the greatest virtue. Their conversations were recorded and I chose one to launch what I hope will be our very first podcast! This is the fourth year I have taught this class and from the beginning I have wanted to record our amazing conversations. The greatest obstacle was their understandable hesitance about being recorded. But for the first time in four years, I have a group who is willing to share their incredible mental meanderings, authentic questions and positively wonderful conversations with the world. In this nine minute conversation, you can hear Marie-Lise skillfully get Brandon to agree that his argument needs some attention. She does a Socratic 'slam dunk' on him by about minute six where you can hear other students giggle and Brandon moans audibly. They did a great job trying out their skills and hats off to Brandon for his honesty. He actually changed his mind and agreed with Marie-Lise. How many adults do you think could learn from him? Have a listen for yourself. The students would be thrilled if you left a comment! Chance, serendipity or maybe just too much time in front of the screen brought another sweet connection this week. I have 'discovered' some of my favourite educators are reading the same book I am; David Weinberger's "Too Big to Know". I heard Spark's Nora Young (from CBC) interview David Weinberger and immediately recognized a thinker who asked valuable questions. He spoke about the shape of knowledge that has changed as a result of the digital revolution. Information is no longer shackled to print and paper; it has been liberated and hyper linked right to your questioning mind. What an idea! Think of it; information is morphing from a pyramidal structure (top down, hierarchy, controlled by the few) to a network, shaped by the users and the nodes of that network. It's simply brilliant and the implication of that idea has no end of exciting consequences. So I bought the audio book the within the hour and began listening to Weinberger. In the same Spark episode, Nora Young also interviewed Luciano Floridi, a philosopher of information who asks the question, "Why is the information revolution so dramatic?" We have been through three previously revolutions, according to Floridi. From Copernicus (we are not the center of the universe) to Darwin (man is not the center of creation) to Freud (human beings are not the pinnacle of rational creatures) but this digital revolution is the most dramatic. How does this impact our self understanding? Who is man and what is his purpose? These metaphysical questions have lived in the philosopher's heart from before Socrates. 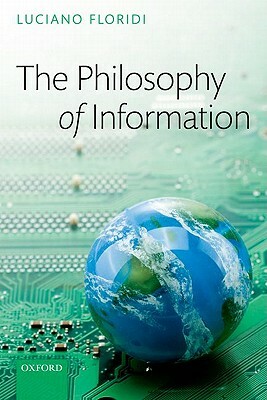 Now, in this digital revolution, Floridi attempts to answer that question; we are interconnected information organisms. And, we are not alone. The shape of the network, the connections to like minds, to information, to nodes in our networked circles, reminds us that we are not alone. Pretty dramatic stuff. All I wanted to do was shout out the virtual book club on Twitter #edbookclub where the good folks (many from Unplugd.ca - another serendipitous story) will be discussing Weinberger's book. A virtual book club on Twitter; another brilliant idea. Posted from Diigo. The rest of Bookmarks for Blog group favorite links are here. I confess. Straight up and out of the closet. I love digital video editing. I fell in love with screencasting on the first try. My first video was made with Adobe Premier Elements (a terrible program); then I tried the free screencasting programs such as Jing Pro, Screenr (fabulously easy and great for quickies on the fly) and Screen-cast-O'Matic. I was seriously hooked after I bought Camtasia Studio 7 and now I'm thinking of trying Sreenflow for Macs. Why is this important? For two reasons: a) because effective teaching should include multi-media elements and b) building digital content that teachers can archive on their wikis or class websites is easier today than ever before. My class wikis are turning 4 years old this year and I've accumulated an impressive amount of digital content, both from my students' efforts and my own. 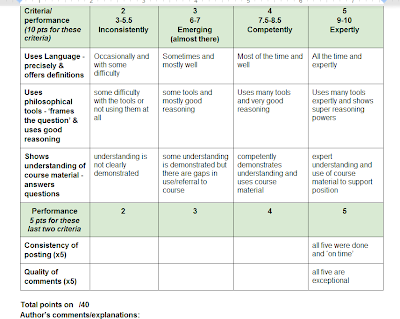 Flipping classroom instruction is garnering much attention and despite some controversy from inconclusive research, many teachers are setting out to build elements of the 'flipped classroom' into their instructional design. That means videos or some multi-media presentation will become as important to teachers in the 21st century as paper was in the 20th! We need to learn how to make effective instructional videos. Correction; I need to improve my own videos. When I look back over my instructional multi-media designs since 2008, I run the gamut of emotions from embarrassment (OMG, how terrible is that!) to indifference (ho, hum, boring) to satisfaction (hmm, not bad that one!). So, I have committed to trying out a new screencasting program on my Mac (the past ones were made on PC) and will report my progress on the blog. More importantly though, will be the implementation of multi-media design principles from studies done by Richard Mayer, an educational cognitive psychologist at the University of California (UCSB). Since the late 90s, he has been researching 'cognitive overload' and 'dual processing system'; information comes to the brain through both the eyes and the ears, hence the 'dual' system. Processing information and holding it in working memory long enough to make 'sense' of it is the brain's challenge. The teacher's challenge, or anyone designing instructional videos, is avoiding the deadly brain shut-down that happens when too much information is aimed at the students. Mayer proposes simple design principles that I will explore in the coming weeks and shamefully (or not) share my attempts at integrating these ideas in my videos. You can give me a thumbs up or down, or maybe just some honest feedback. I know my students will do the same!